In an email Sunday to 40 million eBay users, eBay CEO John Donahoe urged them to oppose the Marketplace Fairness Act unless the small business exception, which exempts online retailers with less than $1 million in out-of-state sales from collecting sales tax, is raised to $10 million or 50 employees. 2. Collecting sales tax doesn’t require the resources of a large company. 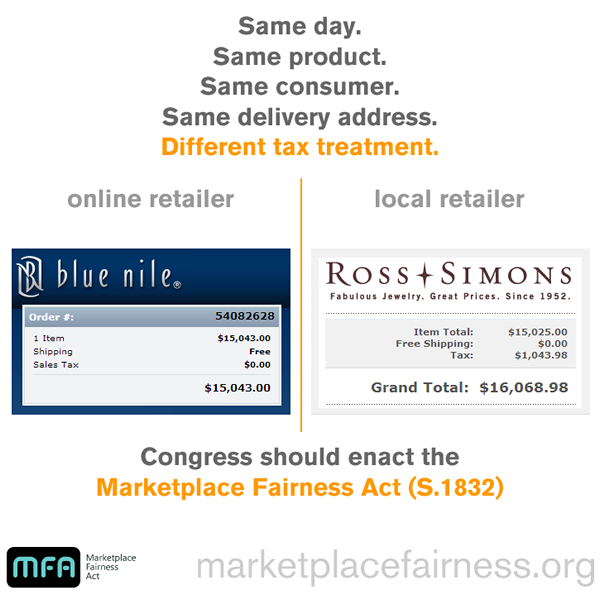 The Marketplace Fairness Act requires states to provide free sales tax software and services for online retailers, so online businesses wouldn’t need to spend anything to comply with the bill. 3. Most small online retailers already use e-commerce platforms, which can easily provide add-ons that handle sales tax, just as they provide for shipping—making sales tax collection easy for all their retailers at once. And we’d lay odds that once states can require online businesses to collect sales tax, that’s exactly what they’ll do. By exempting online retailers with less than $1 million in out-of-state sales, the small business exception already does what it was designed to do: ensure that small online businesses are not burdened by online sales tax collection. But raising the exemption threshold to $10 million or 50 employees would be a mistake. *According to Internet Retailer‘s Second 500 Guide, only the top 980 online retailers in the nation had over $1 million in sales in 2011. Sales tax shown is based on delivery to a Connecticut address. Connecticut sales tax rates are among the lowest in the nation. U.S. e-commerce sales totaled $47.51 billion during the second quarter, up 17.5% from $40.42 billion a year ago, according to seasonally adjusted estimates released today by the U.S. Commerce Department. E-commerce accounted for approximately 4.6% of total retail sales during the second quarter, its highest level on record, the Commerce Department says. Total adjusted retail sales during the second quarter reached $1.04 trillion, according to today’s report. E-commerce accounted for 4.5% of total retail sales during the first quarter of 2011, and 4.2% of total retail sales during the second quarter of 2010, the Commerce Department says. When excluding sales in categories not commonly bought online—automobiles, fuel, grocery and restaurant meals—Internet Retailer calculates that e-commerce accounted for 8.4% of total retail sales during the quarter, up from 7.3% a year ago. This calculation is based on Q2 retail sales totals the Commerce Department released last week; that report put total adjusted retail sales for Q2 at $1.16 trillion, higher than the retail total released today. The Commerce Department did not immediately respond to a request for explanation about the difference. Those are incredible figures: Q2 online sales at Saks were up 50% from a year ago, while bricks-and-mortar store sales were up only 15.5%. Those statistics make it easy to understand why so many Main Street retailers are concerned about online sales. While Saks has an online store, the local bike store probably doesn’t, and it’s likely to lose many of its sales to online retailers. Online retailers should be required to play by the same rules as Main Street retailers. When exempting online retailers from collecting sales tax gives them a perceived 10% price advantage, how can any Main Street retailer compete? The Census Bureau released new retail figures last week, including figures for e-commerce sales in the first quarter of 2011. We did a little math to figure out, based on those first-quarter figures, how much we can expect in e-commerce sales for this entire year. We averaged the ratios of first-quarter e-commerce sales to total e-commerce sales for 2009 and 2010, which gave us a figure of 4.24—in other words, the total e-commerce sales for the past two years have averaged about 4.24 times as much as the first-quarter sales. 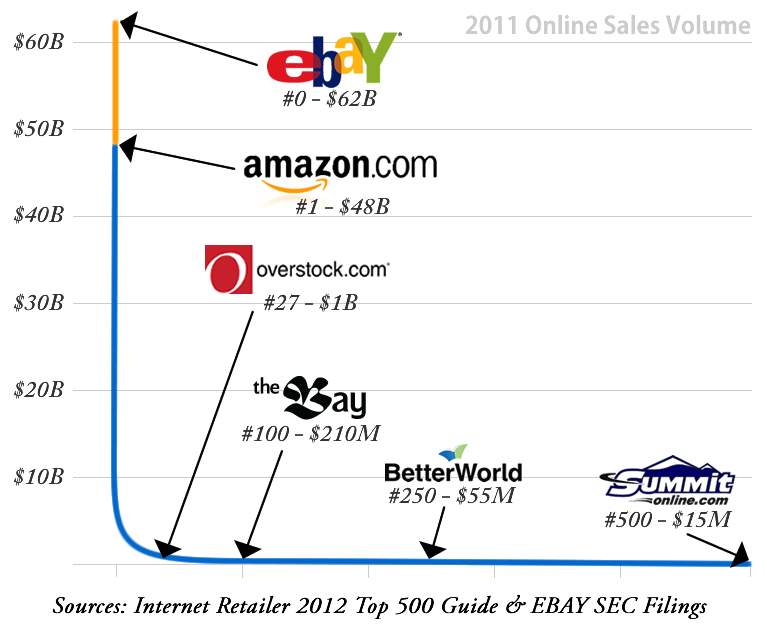 Using that ratio for 2011, we multiplied the first quarter e-commerce sales figure of $46 billion by 4.24 to get just over $195 billion. We should point out this figure does not include sales from online auctions, mail-order catalogs, telephone orders, or TV shopping networks. Now for the most interesting part: how much sales tax (or use tax) due will actually be collected/remitted? At the current average sales tax rate of 6.85% percent, the total sales tax due on $195 billion is approximately $13.5 billion. However, according to California’s Board of Equalization, typically only four-tenths of one percent (0.04%) of the tax due on e-commerce sales is collected. Which means that (drum roll, please). . . Although about $13.5 billion will be due, the states can expect only $53 million in revenue, unless Congress takes action by enacting the Main Street Fairness Act. With our states in such dire fiscal condition, we hope Congress will allow states to simply collect the tax that is due, instead of raising taxes. Yesterday (January 14) the U.S. Census Bureau released advanced estimates for December 2010 retail sales. As we first reported one month ago early indicators at that time were that online and mail-order shopping were expected to experience over 13% growth of 2009 results. Now with data in for December, the picture looks even brighter (for online retailers), indicating 15.7% growth over 2009 data (closely matching Cyber Monday’s 16% growth over 2009 recently reported by by comScore). The Census Bureau report estimated sales activity for the entire Nonstore segment (NAICS code 454) at almost $362 billion. This Nonstore segment includes Electronic Shopping and Mail-Order Houses NAICS: 4541, Vending Machine Operators NAICS: 4542, and Direct Selling Establishments NAICS: 4543. Over the last few years, the Electronic Shopping and Mail-Order sub-group accounts for approximately 75% of the combined category, suggesting almost $272 billion in online sales. December was much stronger economically than the rest of the year (particularly for Home/Garden and Health/Personal). We suspect quite a few1 of the online & mail-order transaction did not collect sales tax at the time of the transaction, even though the consumer(s) are still expected to voluntarily report and remit those sales taxes (as “Use tax”). With so many states in such deep fiscal crisis, expect the 112th Congress to finally address this issue. As always, we welcome your thoughts!